I journeyed today to New York City by means of the New York Tribune dated June 5, 1917. 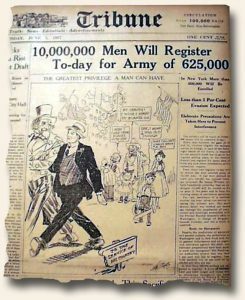 There I found the bold headline announce “10,000,000 Men Will Register To-day for Army of 625,000”. “The nation’s roll of honor of 10,000,000 names will be compiled to-day. Every man between the ages of 21 and 31, whether eligible for military service ore exempt, in each of the forty-eight states of the Union, is required by the selective draft law to go to the regular polling place in his election district and register his name, date of birth and such other information as authorities require…”. This was the beginning of the draft for World War I.